How we use our bodies, take in the world through our senses, and connect with the ecological and social communities we move through is something that is of utmost importance in the VBike philosophy and vision. In some ways, what VBike is promoting is really not so much about the bike, but more about relationships to the world around us. We Vermonters have a unique heritage. We have a vital and special relationship to the land and all who inhabit it, human and non-human alike. It's a reciprocal relationship between us and this nature-rich state. VBike is here to help re-explore some of the best elements of what that means. The bike happens to be our vehicle of choice. For nearly 100 years, the automobile has been the vehicle of choice in Vermont. It has been a modern miracle and in many respects a blessing for Vermonters, connecting us in unimaginable ways and changing our world. However, like most of the technologies we have become wedded to, there another side to the story that is elusive and seemly immensely difficult for us to notice. Every time we drive we participate in making the world far less habitable for beings who are not confined within its partitioned domain. This may sound like a harsh judgment to some, but it's important to understand that this phenomenon really isn’t completely our fault. 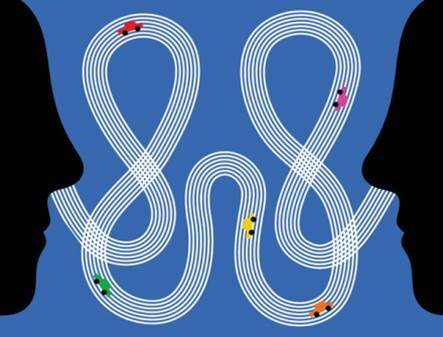 The very architecture of the automobile not only inherently limits our sensory perception to the world outside of the car, but it also restricts our sensory awareness of the impact we have on the ecological and social worlds we pass through. This radically mediated experience is precisely what makes the automobile so comfortable, but it is also what inhibits us from authentically bearing witness to our profound and oversized influence on the world. 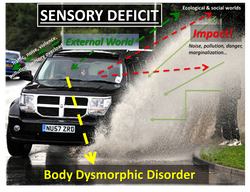 Slide from VBike’s presentation relating to the sensory deficit experience within the confines of the automobile. Body Dysmorphic Disorder is a DSM term referring to the misrecognition of our actual body shape and size. Given this, there is a tangible loss of empathy within the automobile that most of us momentarily notice. It just has to do with the way the car is designed and its immense power. As we drive we are mostly unaware of what it feels like outside the confines of the car because our senses simply operate exceedingly weakly beyond its barrier. This overriding of our sensory functioning is a plain fact. In some ways then, we are abandoning our direct emotional experience of the landscape and social environments all the while our confinement within the automobile short circuits our ability to perceive the effect we have on the world. And on top of that, our bodies become veritably obsolete for our mobility. But all this is perhaps immensely difficult to comprehend because when we get into a car we are a dramatically changed being. As much as we think we get into it, it gets into us. In comparison to automotive travel, biking involves a far richer and connected experience to our social and ecological environment, and our bodies. This allows for a greater awareness of our impact on the world and on those around us. In fact, on a bike we potentially add a nice measure of conviviality and joyfulness to our streets. And we can do that virtually pollution-free, to boot. Simply put, VBike believes that direct physical participation in our mobility along with the opening of our senses are vital elements for our personal health and the well-being of our precious Vermont communities. Carbot dreams from the 1950's. Nearly every day it seems that we are being asked to adopt some new technology – a gadget, an app, an accessory, an upgrade. It just keeps on coming with barely a moment to consider the impact on our world or to ourselves. It sometimes feels like a techno-juggernaut. Speaking of this, there are all sorts of new automotive technologies ready to come down the pike. We already have an endless array of new gadgets in our cars and now they are starting to close their own doors, talk to us, and self park. What's next? The carbot, or self-driving automobile, is on the way and coming sooner than you might think. This is actually the "more true" automobile, because the word "automobile" literally means "mobility with little or no engagement and involvement from us." So, as the car is about to become a greater likeness to its namesake and even further disengaging us from the world, this could be a good time to shine some thought on where exactly it is taking us. At first glance, effortless transport just might seem like one of the best ideas ever. However, once we take our bodies and senses out of the equation we lose the vital ingredients required to apply our common sense. "Common sense", according to Marshall McLuhan in his landmark book Understanding Media, refers to the "unified ratio among the senses that was long held to be the mark of our rationality." In other words, for us to be rational we need a balanced "ratio" of the bandwidth of our senses online and engaged! Without this, our thoughts, behaviors and actions may more resemble the technology we use rather than our own. Perhaps in some respects, our worldview and mindset are conforming to our automobiles - we are becoming psychologically enmeshed with them. This may be important to consider because the car is going through a considerable reinvention right now - hybrid, electric, fuel cells, and the aforementioned carbot technologies are all coming our way. It's all pretty seductive and in some ways very cool. But change the car however you like, it still leaves us with most of the same old problems - unsustainable development, disengaged bodies, sprawl, massive resource consumption, obesity, sensory isolation, social fragmentation, and much more. What may be worse than all this is that we pass all these things on to our children to deal while thinking and believing we have actually solved "the problem.” There is neither common sense, rationality, nor fairness in that. Of course, we’re not at all saying that everyone is going to give up their cars and all bike and walk instead. That's just not possible in any shape or form, especially in Vermont. So many of our decisions and lifestyle choices, as well as much of our city and town planning, has been oriented with the "automobile in mind." However, VBike's vision is one of balance. We are working to introduce a diversity of options that bring a more human face and presence to our streets and towns. This balance will not only look, sound, smell, and feel a heck of a lot better, but also it will be way more fun and bring us back into the ecological and social conversation of the world we inhabit! If you would like to investigate this further, please take a look at our page about the Slow Transportation Movement. Our sensory connection to the social and ecological environments we inhabit is a vital element to how we bond and attach to our world. We all know that the world our children will inherit is bound to be profoundly different that the one we inhabit right now. There are signs all over that we need to think, act, eat, live, and move around very differently than we do now. That means that the everything-stays-the-same version of living inspired by the 1950’s just won't work for what we face today. At this juncture in history, the facts are on the ground and in the atmosphere are calling on us to do something very different. Clearly, there are things holding us back. One huge issue we face is balance. When any system is pushed toward an intensely diminished level of diversity it is generally thought of as being imbalanced. This is true for ecosystems as it is our transportation system, which resembles something more akin to a monoculture. Imbalance typically leads to a high degree of vulnerability and dangerously low levels of creativity. VBike envisions a greater emphasis on creative local living and strong neighborhoods where our children, the elderly and all members of our communities can thrive, engage their bodies, be connected to their senses, and revel in a healthful relationship to the more-than-human world. That will mean more people actually in touch with their surroundings and with a more conscious awareness of other members in the community, human and non-human alike. Researcher, Bruce Appleyard, showed that children who bike or walk are significantly happier with their environment. He also found that they far more able to accurately depict streets & features of their community than children who regularly have the “windshield perspective." With our senses and bodies engaged, our creativity returned, and common sense restored, our will to work towards balance and change just might get re-energized. When more of us really "show up" in the world, that's when things happen. There is simply power in numbers. This is what we mean by "change the bike and the infrastructure will follow." Showing up may also translate into more pedestrian amenities, public transit options, innovative approaches like car shares, rail transport and communities that focus on resiliency and inspired planning. Meanwhile, what VBike has to offer by updating the bike and making it more relevant to our lives will bring the sheer enjoyment and thrill of biking to a diversity of Vermonters. It may also get more people involved to help further spur the growing conversation around creative communities, common sense, and balance.